IMPORTANT: This Range/Series overview section describes the range of which this product belongs. Features of different versions might be mentioned and may not apply to the specific product on this page. Please view Specs for specification of product. 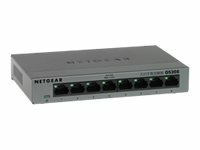 The NETGEAR 300 Series Unmanaged Switches provide easy and affordable network connectivity to home and small offices. They are easy to use and reliable. With these Plug-and-Play switches, you can expand your network connections to multiple devices instantly. The 300 series also support the efficient use of energy, helping you save power and money. All product/company names and logos are for identification purposes only and are trademarks or registered trademarks of their respective owners. E&OE.